Towards 2014...the staff and MPLs from the DA in Bhisho went on teambuilding session in Port Alfred last week to discuss the strategy of the DA legislature team going forward. In front, from the left: Tessa Botha (secretary), Edmund van Vuuren (MPL), Bobby Stevenson (MPL), Eve Viol (secretary) Cecile Greyling (media & research), Veliswa Mvenya (MPL). 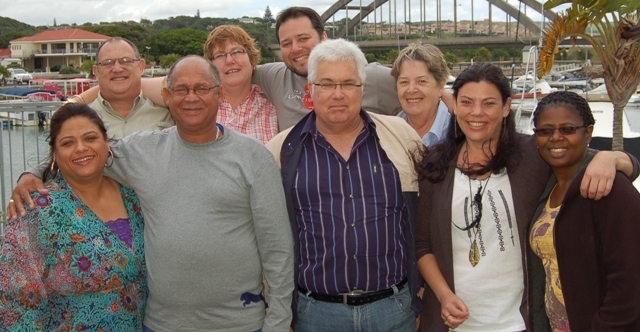 At the back: Dacre Haddon (MPL), Annette Rademeyer (PA) and John Cupido (MPL). The recent legislature to the people event in Cofimvaba has raised a number of questions in the minds of many people. Is it a waste of money? Is it authentic? Is it necessary? The Democratic Alliance believes that there is definitely a place for public participation in the affairs of the legislature but certainly not in its current form. The Democratic Alliance only agreed to participate if the normal speakers list applied. This provides the political parties with the opportunity to respond to the reports presented at the event. Originally there was discussion as to whether or not this would occur. After interaction with the ruling party it was agreed that speaker’s lists would be included. The DA was not prepared to simply engage in a window-dressing exercise where we sat back and watched the ruling party engage in “ANC to the people”. Normally on a Wednesday when the legislature sits, questions for oral reply are the first item on the order paper. The ruling party declined to place this on the order paper and said this had the concurrence of other opposition parties. The DA’s objection was thus over ruled. This is something more sinister than the game playing that the ANC engaged in with the connivance of other opposition parties to avoid questions for oral reply: the heart of democratic tradition was ripped out . The DA believes in building a culture of democracy and accountability for the generations to come. We need to lay a solid foundation of parliamentary oversight that will serve the people not just of today but also in the years to come. Service delivery will never improve unless there is real accountability for governmental failures. This is not something that should be seen as a party political exercise but rather as a tradition that should be nurtured, encouraged and strictly enforced. The DA in the provincial legislature will continue to strive to make our legislature a more vibrant and relevant institution. The people deserve it and we will continue to lead the fight.